Most grants to catalogue, preserve and exploit archive collections are targeted at public sector collections but there is growing collaboration between private and public sector archives which is unlocking some of these grants for private business archives. Business archives donated to public sector record offices are of course eligible for grants. Replacing The National Cataloguing Grants Programme for Archives in 2017, ‘Archives Revealed’ is a partnership programme between The National Archives and The Pilgrim Trust. It is the largest funding stream available in the UK dedicated to cataloguing and unlocking archives including those of businesses. Applicants must however be not-for-profit organisations. Businesses can look to a friends group or a charitable arm/trust that could make an application on their behalf. For more information visit http://www.nationalarchives.gov.uk/archives-sector/finding-funding/archives-revealed/ or contact archivesrevealed@nationalarchives.gsi.gov.uk. To access this funding stream you should work with academics usually economic or business historians – whose research interests tie in with your business sector. For example, part of an academics AHRC bid could include the partial cataloguing of your collection (which makes the sources available for research) but this cannot be the primary purpose of the bid, only an additional output from a research-based project. There is no formal process for finding an appropriate academic, but universities have management and history schools that employ business historians and Glasgow University and London School of Economics, in particular, have specialist business history units. Alternatively contact the Business Archives Council or the Association of Business Historians for advice. 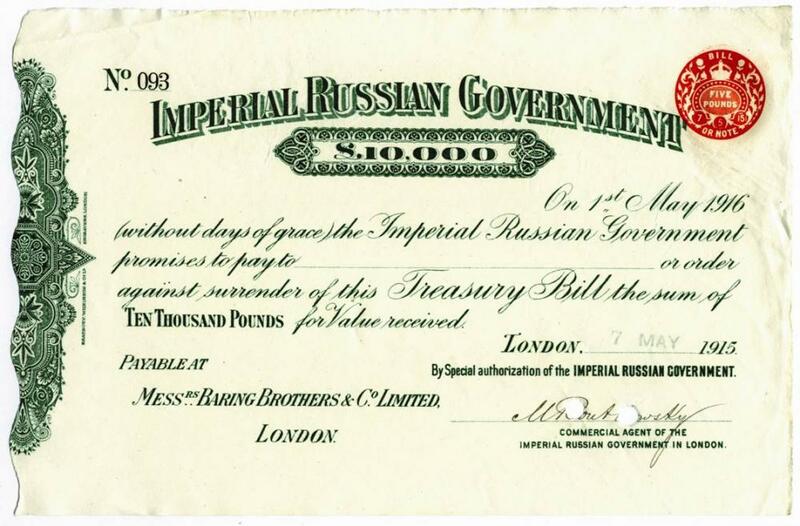 Imperial Russian Treasury Bill. Image courtesy of The Baring Archive.